I don’t know if our Red Cross friends have noticed, but this part of the world is damp. Sometimes, it’s too damp. Southeastern Pennsylvania experiences several torrential rainfall events a year, and while this makes our local flora lush and green, we also live with the threat of flooding, especially in low-lying areas. The Red Cross of Southeastern Pennsylvania is committed to helping people in our area be prepared for disasters all kinds. Recently, we have been developing applications for iPad, iPhone and Android to help people act safely and responsibly in the event of an emergency. Our newest app, provided in both English and Spanish, deals with the most common disaster in the United States: flooding. Everyone who lives in Southeastern Pennsylvania should download this app. When the unexpected occurs, we are filled with questions. What should we do? Where should we go? What should we remember to bring? What dangers should we worry about and anticipate? The Red Cross is doing a tremendous service by making the answers to these questions as accessible as a smart phone. The flood app will save lives, it will provide essential information in real time and it will assist people to recover when the waters recede. The Flood App is the latest in a series of Red Cross emergency preparedness apps that put lifesaving information right in the hands of people whenever and wherever they need it. These apps allow people to make critical, lifesaving decisions. All Red Cross apps can be found in the Apple App Store and the Google Play Store for Android by searching for American Red Cross or by going to redcross.org/mobileapps. Apps are not a substitute for training. Go to redcross.org/takeaclass to take a First Aid and CPR class so you’ll know what to do in case emergency help is delayed. 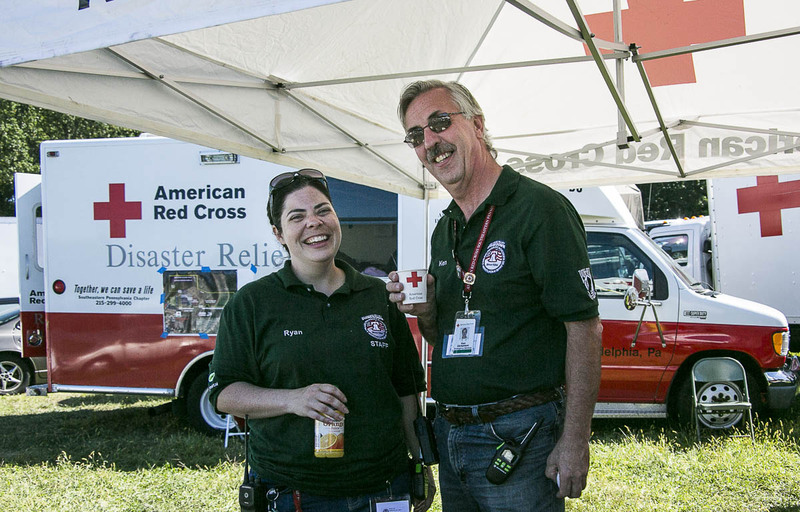 As a volunteer photographer for the Southeastern Pennsylvania Red Cross communications, I have the opportunity to witness dozens of examples of my fellow volunteers on the job. Often, they are not just helping people who have experienced catastrophe, but are on hand at major city events to handle medical emergencies and participate in fund raisers, which are the “life blood” of our local Red Cross. for current and past Red Cross House guests. What an amazing event! Scrumptious food was prepared, cooked, and served by Red Cross House volunteers. Communications, tweeting key information on breaking and ongoing disasters. On Independence Day, a Disaster team was on the job, performing first aid and signing up volunteers. Large city events can sometimes involve crowd related injuries. Red Cross volunteers were on the scene to assist people until late that night.ouse employees and volunteers. 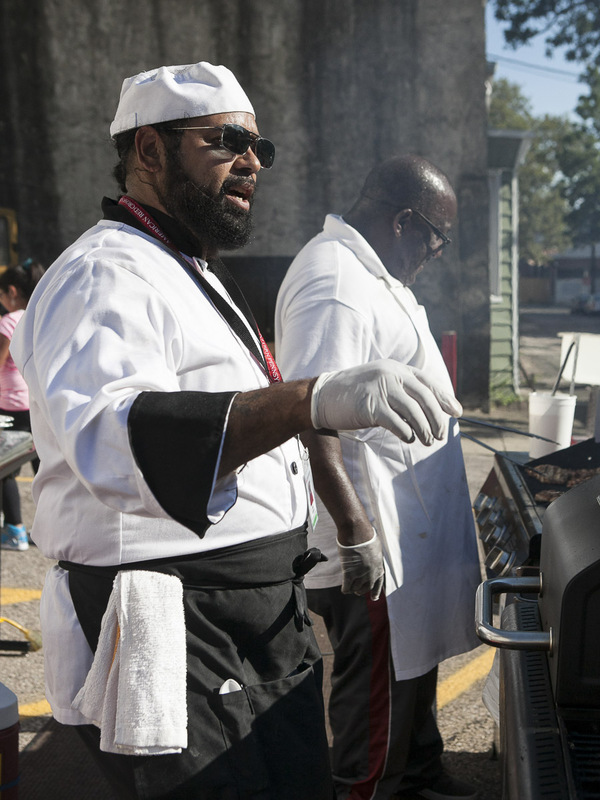 This summer, I photographed the Annual Veterans’ Stand-down, a huge event to connect homeless veterans to essential services in their communities. 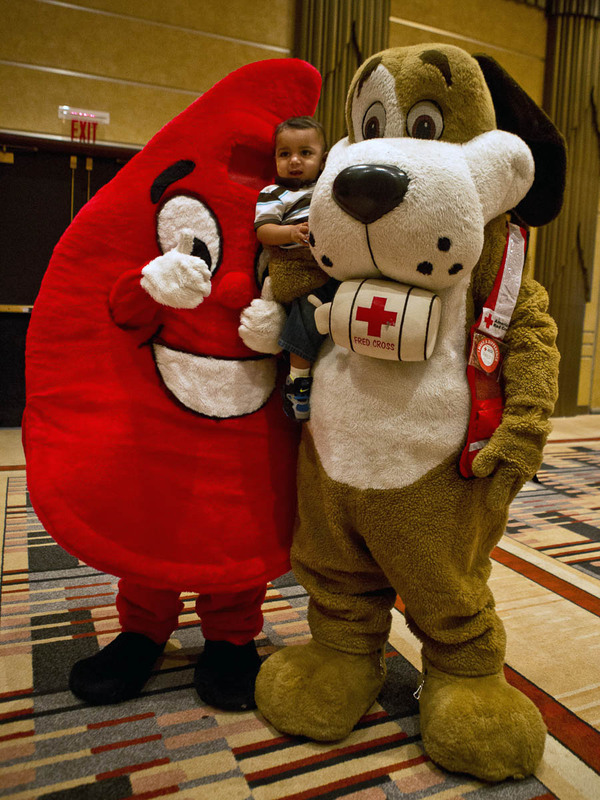 Then there are the people who volunteer to wear the Fred Cross and Buddy Tear Drop mascot costumes to delight the children at the annual Holiday party. It is HOT inside those outfits, but nobody complains. I could go on and on citing example after example, but I think you get the drift. The selfless dedication to the Red Cross Mission, seen day-in and day-out in the hundreds and hundreds of people who do the work of the Red Cross in the Philadelphia area, is so apparent. And the thing that stands out the most for me is that Red Cross Volunteers LOVE the work they do. None would have it any other way. I’m very proud to be associated with the American Red Cross SEPA Chapter, and will always be grateful that I signed up to be part of the team.